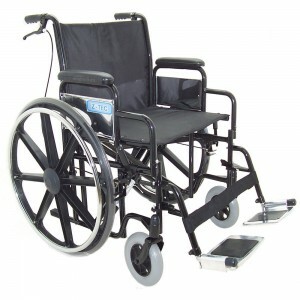 The Z-Tec 600-692 heavy duty / bariatric wheelchair is a wide metallic black steel self propelled wheelchair. It is very sturdy and will provide reliable use for larger users withstanding knocks and bumps. The quality of this wheelchair is very good as with all ZTEC wheelchairs. removable under desk armrests, swing away removable footrests, a seat belt for added security and a calf strap for comfort. The 60cm rear mag wheels give this heavy duty wheelchair a really unique look and make it one of the more desirable bariatric wheelchairs. It also has a double cross brace for extra strength and rigidity. Seat Width - 56cm / 22"
Seat Heigh - 50cm / 19¾"